IN A WORLD… where people love movies and stuff that’s really really funny, one game embarks on an epic quest to create the greatest laugh of all time. Galactic Sneeze presents: SCHMOVIE. What would you call a HORROR FILM about an EVIL BOOGER? A SCI-FI about a GANGSTA LUNCH LADY? A ROMANTIC COMEDY about a CLUMSY PROCTOLOGIST? The object of SCHMOVIE is to come up with funny titles for make believe movies based on a film genre (determined by the roll of a die), combined with an outlandish premise (established by flipping two cards). 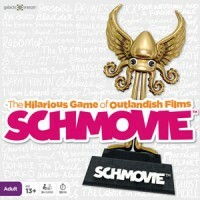 Each round, a Schmovie Producer selects his or her favorite title and awards a Schquid Trophy. First player to collect four Schquids wins! Schmovie can be played family-friendly or for adults-only. It's a hit with kids as young as 8 by removing some of the more mature cards. Or, it can be edged up for some racy laughs by suggesting "Adult Film" when the die lands on the question mark. Additional Schmovie Fun on Facebook! Come join our play-along Facebook page. We post new rounds of the game every Monday and Thursday night, and create custom tricked-out Schquid trophies for each winner. We've now received over 30,000 Schmovie titles and have created hundreds of Schquids! Add a Review for "Schmovie"